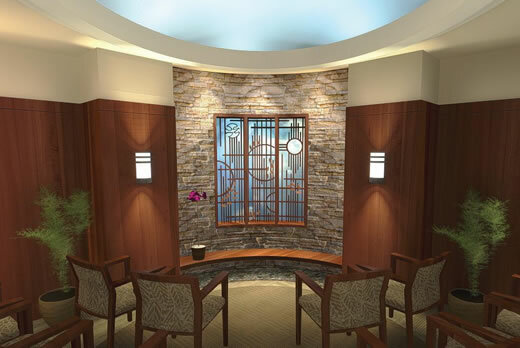 Emory Johns Creek Hospital (EJCH) will hold a ceremony to celebrate the start of construction on its new sanctuary on Mon., March 7 at 3 p.m. EJCH’s CEO, Marilyn Margolis and EJCH’s Director of Spiritual Health, Timothy Park, Ed.D., will provide opening remarks. Laurie Hansen, associate administrator at Emory Johns Creek Hospital, will reveal the drawings and plans for the new sanctuary. Local leaders from Judaism, Muslim and Christian faiths will attend the ceremony to bless the space and construction. They include: Judith Beiner, a rabbi and community chaplain with Jewish Family and Career Services of Atlanta; Noor Abbady, program manager of Interfaith Speakers Bureau of Atlanta, who will represent the Muslim community; and Tom Kenny, a volunteer chaplain at EJCH. Park, who also educates chaplains-in-training through Emory Healthcare’s Department of Spiritual Health, provides spiritual care for patients and their families at EJCH. Emory Healthcare’s spiritual health team includes 46 full time staff and 52 part time staff who work across the health care system. The new sanctuary, which is expected to open in July 2016, will be located on the main floor of EJCH between the gift shop and Physicians Plaza. It will stay open 24 hours, seven days a week. For more information, call 678-474-8200 or visit www.emoryjohnscreek.com.